On the internet, you can find virtually anything you want, but not all is as it appears. That on-line dating profile... says he or she is 39, but actually 43. Stretching the truth a bit. But what if they're 56?. Today's lesson- The "Grab yours NOW at our special price of $299 from $695 MSRP" road bike (Mercier Galaxy SC1), courtesy of bikesdirect.com. This is the 56 year old claiming to be 39. Advertised as a $695 MSRP bike selling for $225, this is the internet, so anything goes! It never ever sold for anything close to $695, and would be worth, assembled, maybe, $350. It's not spec'd anything like the bikes it claims to compare to. This bike came to my attention when I received an email from someone, asking for assistance in setting it up for him, saying that the manufacturer says it should only take "25 minutes." If you pull it out of the box, throw on the pedals, tighten the handlebars and inflate the tires, yes, it might be just 25 minutes, and you'll end up with a K-Mart quality bike with a few nicer parts. But if you build it the way we (and most other competent bike shops) do, it will involve removing the tires & tubes to make sure the rimstrips in the right place and the tire & tube were correctly installed, lubricating all threaded surfaces (they come "dry" from the factory ), truing the wheels laterally and inspecting them for deformities caused in shipping (happens more often than you think), making sure all bearings are properly adjusted, replace "factory" chain lube (which is often the consistency of light tar) with something that will allow it to shift better, ensure there are no kinks in brake or gear cables & housing and replace as required, and finally, the simple stuff like installing seat, pedals & handlebars. And then it needs to be test-ridden to settle things in, and checked again. And double-checked by another mechanic. That 25 minutes bikesdirect.com quotes just became two hours. And the bike still isn't fit properly to the rider. Besides frame size (the easiest thing to figure out, but not as important to proper fit as what follows here), you've got stem length, handlebar height, handlebar width and handlebar reach. Because people come in all manner of shapes and sizes, and it makes a huge, not subtle difference, getting things right. Bar width should approximate shoulder width. Stem length should be set so the rider is in a relaxed position when using the brakes. Forward reach should be very short for those with smaller hands. Drop from seat to bars is determined partly by rider flexibility. All this stuff comes into play when a decent shop sells a road bike. But the bikesdirect.com model has 40cm wide bars on the smallest frame (too wide for just about anyone who'd ever use a bike that size), and a 90mm stem (too long in nearly every case). Minor stuff compared to what comes next. It "features" a standard, not compact, crank design with a 39/52 chainring combo. Exactly what a real racing bike has... which is great. If you're racing. But if you aren't strong enough to ride the Tour de France, and you've got hills in your area, that gearing's going to kill you. Every legit bike company is currently spec'ing a "compact" crank with 34/50 gearing, far easier to get up hills with, on their entry and mid-level bikes. 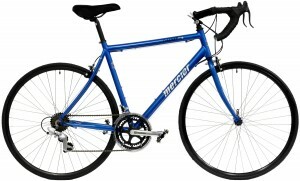 If it's flat where you live, the bikesdirect.com model might be fine. Otherwise, it's a very expensive change to get suitable gearing. How could you be expected to know all this stuff? You can't. That's how they get away with it. And then there's the pricing comparison. Aside from spec'ing the bike with parts that are often inappropriate and expensive to change, they also use a stem shifter. Yes, the same type of stem shifter you'd find on a K-Mart bike. Saving about $250 over the integrated brake/shift levers found on a quality bike in a local bike shop. Wheels? Cheap old-style freewheel, not cassette, leading to a very shortened lifespan. They could reasonably claim their bike, fully set up, would rival a bike of approximately $400 in a bike shop, but nothing close to $695 "MSRP." Nor did the bike ever sell, anywhere, for anything close to that (in fact, the most this bike ever sold for was $299). But you still wouldn't have a bike that's been fit properly, nor a bike that has a local shop that maintains a sense of ownership of the bike if something goes wrong. No warranty except by phone and sending the bike back. Can you save $$$ by buying a bike in a box on the 'net? If you know what you're doing, how to get properly fit, have the parts needed to make changes so it's appropriate for the riding in your area, then yes, you can save a few dollars. But nothing like bikesdirect.com claims, which puts them into the category of misrepresentation, fraud or even scam. There are reasons that companies like Trek and Specialized and Giant sell bikes only through local dealers. It ensures that you get a bike appropriate for the cycling opportunities in your area, properly assembled and fit, and a place to bring it back to in case something isn't quite perfect (because yes, in the real world, there can be defective parts, and what seems to be a great fit at first might evolve a bit as you go on longer rides). A bikesdirect.com bike offers none of that. Which is fine, people deserve a choice. But what's not fine is when they tell you it's the same as buying a much-more-expensive bike, or that just 25 minutes work and it will be in great shape. PS: Bikesdirect.com even claims their sizing runs the same as a Trek, essentially encouraging people to find out from a local shop what size they take, so they can order their cheaper bike. But they do not size the same, nor do they offer any degree of customization that is standard with a local bike shop. Nor are the Mercier and Motobecane brands they sell in any way the once-great companies making them back in the day. Bikesdirect.com simply picked up expired trademarks and slapped them onto their bikes. Windsor too, but strategically that was a mistake; anyone familiar with Windsor back in the day would not likely have positive feelings about the name.